Promises, promises. There’s good reason people don’t trust politicians. 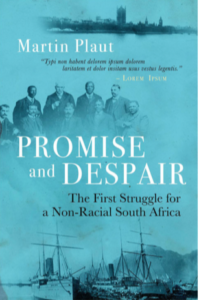 Black South Africans werePromised time and again by the British they would be rewarded and empowered in exchange for their support, and time and again from the 18th century on, those spent promises led to their Despair.But what path led away from their enfranchisement – which was once a matter of record (males only,of course)? This is the story of that struggle. Its center piece is a lively account of the delegation that travelled toLondon in mid-1909 to lobby for a non-racial constitution. But there were other participants, includingMK Gandhi, whose own fight for the rights of Indian people in South Africa is woven into this story. Including the ANC, were unable to resist the tide of white racism.